I blame my parents: they took my brother and me to Fiji for our last 3 years of high school, ruining any chance of us ever happily living long-term in the US again. My brother was the first to leave. When the youth pastor at our church in North Carolina, where we moved after Fiji, asked him what he really wanted to do, Greg’s reply came quickly: Go to Hillsong College in Sydney. So, after only 2 ½ years back in the US, he was off again. Nine years later, he and his South African wife moved to Cape Town; I’m pretty sure he’s going back to the US only to visit. I took a little longer. I think I always knew I wanted to be a teacher, except for a very short period of time during which I wanted to be an astronaut, so I decided that after college, I would teach for three years in the US and then I would go to another country; I figured it would be best to have teaching experience before going overseas. Somehow, I actually did end up teaching for three years before I left. My first try was a false start. Sometime during the summer after my second year of teaching middle school English in Fort Worth, Texas, I went to a Peace Corps information session. 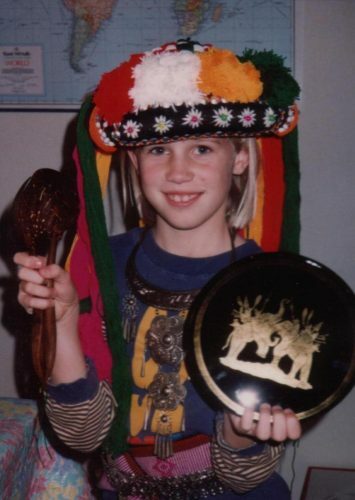 I applied soon after, as joining the Peace Corps just seemed to make sense for me. After writing a couple of essays and going to an interview, I was nominated. I then began filling out a huge stack of medical forms, but before I could finish, I received a letter in the mail, three days after Christmas 2010. “We regret to inform you that we are no longer considering you for service.” I was stunned. How could someone be unnominated? It’s not even a word! In my opinion, I was the perfect candidate: a qualified teacher, young, with no debt, who had already lived overseas. When a colleague of mine spoke to her friend, a top Peace Corps recruiter in California, about my situation—my recruiter didn’t give me a reason for my rejection—she also was surprised and unable to offer an explanation. I was pretty embarrassed when I told my principal I would not, in fact, be leaving my school for the Peace Corps and somewhat resignedly signed a two-year contract. But several months later, I called to tell him that this time, I really was leaving. During a Skype call with a good friend who with her family had recently moved to Bangkok as missionaries, my friend suggested that I come teach there. I applied—immediately—to the only school they were looking at for their daughters that had an open English position and was offered the job within days. After I made the decision to go to Thailand, I spent several nights at my parents’ house alone. I woke up in the middle of those nights terrified by the consequences of my decision. What was I thinking? Going to a country that I’ve never been to, that, turns out, takes literally 24 hours to reach, BY MYSELF. Giving up a well-paying job in a terrible economy. Leaving the comfort and safety of my American life. In the middle of the worst night, I decided I wasn’t going. I was going to ask for everything back that I’d given away—my dining table, my washer and dryer—and live at my parents’ house (they’d already made the decision to move back to Fiji) and try to get my job back. I called a particular friend multiple times during these few days, trying to figure out if I’d made the right decision. What gave me the greatest peace during this time was a memory of me decked out in Thai tribal style. When I was in third grade, we hosted missionaries to Thailand at our house for a few days. Missionaries who visited our church often stayed with us, and while we had lots of missionary guests throughout my childhood, this particular family was the only one I distinctly remember, which could have a lot to do with this picture. Little did I know that that experience planted a seed in my heart, ultimately leading me here eighteen years later. Little did I know that I would meet my husband here. Little do I know what is to come, but I believe that seed is already growing. Oh Susan.. such a big step alone. We were amazed that you wanted to do it but knew that God would be with you all along the way. Yes, we’re to blame… but that’s okay – your eyes were opened to more than just the US – to more than what was comfortable or what you were used to. And it’s made all the difference in your life and in Greg’s as well. We are blessed with two more great kids and a beautiful grandson! Thanks, Mom! I’m so grateful for the experiences I’ve had because of your leading!